Wide shot of the Security Council in session. Reiterating the need for warring parties in Yemen to resume dialogue, the Security Council has condemned the latest missile attacks by the Houthi rebels targeting several cities of Saudi Arabia, including its capital, Riyadh. Since the uprisings in Yemen broke out in early 2011, the UN has been engaged in helping Yemenis to find a peaceful solution. However, on 26 March 2015, a coalition of countries led by Saudi Arabia intervened militarily at the request of President Abd Rabbuh Mansour Hadi to secure the return of the Government to Sana’a, which had been seized by Houthi militias and allied units of the armed forces. Three years on, the fighting is raging and the ensuing humanitarian crisis has only deepened in a country that was already one of the region’s poorest. 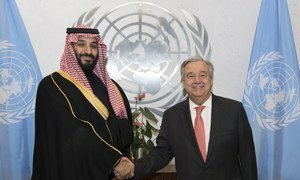 Ahead of the upcoming international fundraising conference for Yemen, the United Nations has received nearly $1 billion contributions from Saudi Araba and the United Arab Emirates (UAE) and urged other donors to follow suit and help tackle the world’s worst humanitarian crisis there.